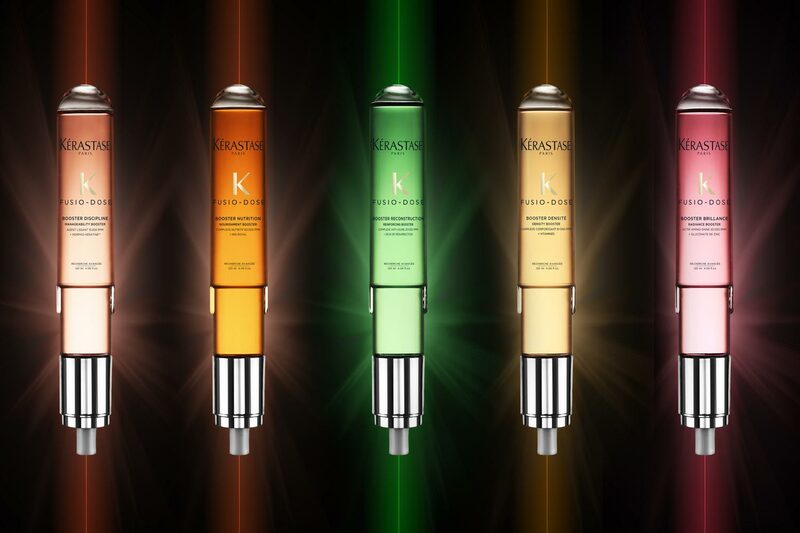 Back in 2011, Kérastase PARIS blazed the way for bespoke hair care with their customized, stylist-mixed super-concentrates. fast forward to today, and the brand new Fusio-Dose tailor-made treatments are nothing short of cutting edge. With improved efficiency and personalization, Fusio-Dose features a dual dosage of formulas: one concentrate, which addresses primary hair needs, and a booster that addresses secondary hair concerns. 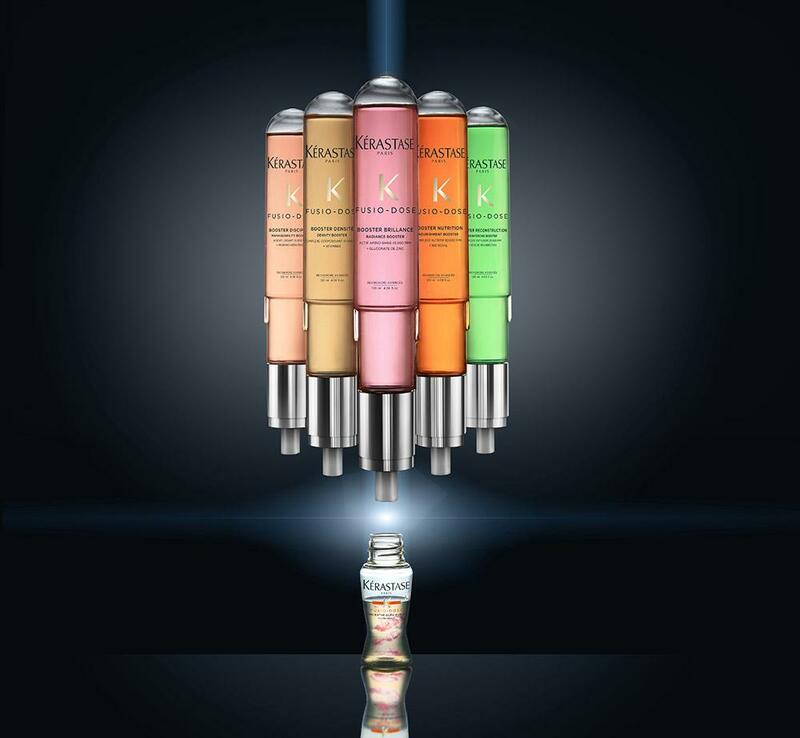 With four concentrates — Concentré Pixelist adds major radiance, Concentré Oléo-Fusion deeply nourishes, Concentré Vita-Cement supremely strengthens, and Concentré Densifique boosts body and density — and five different boosters that add nourishment, manageability, radiance, density or strength, there are twenty (!) 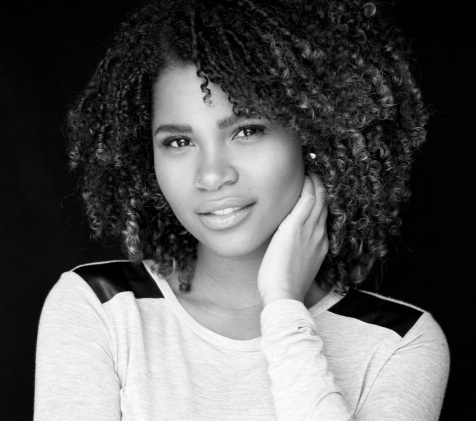 custom combinations to specifically treat every individuals’ hair needs. With so many options to create your own personal and most effective treatment, a quick consult with your stylist is the first step of the Fusio-Dose process. After assessing your hair and desired results (give me shine and fullness! ), your stylist will then select the best combination to treat your strands and will then mix up the magic right then and there. The boosters are housed in futuristic tubes that automatically release the perfect quantity of formula into the concentrate, making for a flawless application that takes a remarkably swift five minutes. Although neither a blow drier nor hot tool has touched my hair in at least two years, my mane has succumbed to the onerous process of maintaining a sandy blonde shade not quite my natural colour (thanks, bleach). 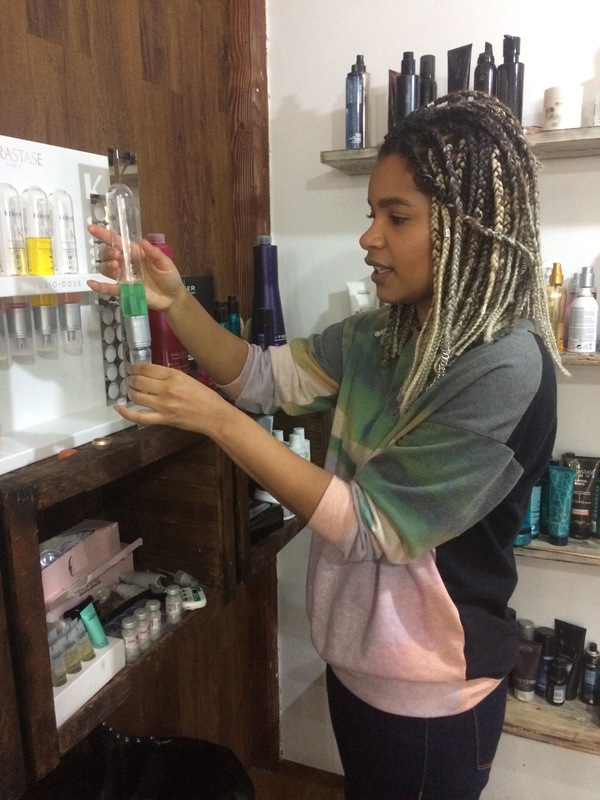 Fusio-Dose immensely intrigued me as the results are adjusted to your hair’s needs — with my hair suffering a little chemical damage and a looking a bit lacklustre, I was keen to see what transformation could take place with a Fusio-Dose treatment. The talented (and super sweet, smart and all around lovely!) Jasmine Merinsky proved everyone can benefit from the treatment; I got an exclusive interview with the super-stylist at the Brennen Demelo Salon while experiencing my own custom Fusio-Dose treatment. Below, Jasmine breaks it all down, and for the record, my hair now rivals that of a VS Angel, only it is most certainly softer and stronger. AmourAimée: Why did you advise the Concentré Densifique as my primary treatment? Jasmine Merinsky: I chose the Concentré Densite as your primary need based on the conversation we had during our consultation. Your hair is finer textured with minimal damage, and you mentioned that you don’t like to use hot tools or many products as styling aids. As a result of that, your hair lacked body and movement. Since the treatment is designed to improve the elasticity of your hair and offers density and thickness, which were both qualities you wanted to improve on, I though it would be best to go with that as your primary need. AA:How does it differ from other thickening products or treatments? JM:I can’t speak on behalf of other products, but the Kérastase treatments are the first in-salon care ritual that is completely tailer-made, and able to meet the specific needs of every hair type. The Concentré Densite is enriched with pro-calcium that instantly makes the hair stronger and more supple. The hair fibre regains tone and body making it re-densified and easier to style. AA: How much more concentrated are the concentrates than the boosters? JM: The ratio of concentrates and boosters has been recently modified. The dosage of the boosters was multiplied by 15. Each formula’s star ingredient is presented in a new type of container similar to a 120 ml test tube (against a 0.4 ml before). AA: How long does the treatment last? It depends how often you shampoo your hair, but approximately 4-6 shampoos. AA: Is there anything I can do to increase the treatments longevity? JM: To increase your treatment’s longevity, you should wash with Bain Densité, which is a thickening shampoo, or Bain Thérapiste, a repairing and unique balm-in-shampoo to further strengthen your hair (Editor’s note: this was my secondary concern; we used the strengthening booster.) Follow up with the corresponding Masque Densité, a densifying thickening masque, or Masque Thérapiste to further reconstruct damaged hair. We used the Thérapiste line with you, and finished with the Ciment Thermique, a lightweight resurfacing and heat-protecting milk, and Spécifique Soin Densitive GL spray, which thickens strands and texturizes. [Editor’s note: I can’t. Stop. Using this stuff! It tingles on contact and stimulates the scalp by increasing circulation; it also makes my hair fuller in a soft and natural way). Because each treatment is unique, the aftercare should reflect that. There is a Kérastase range that suits every treatment and will help maintain the results. Jasmine adds the strengthening booster to the Concetré Densité. AA: Are there specific products at home to use that are good for every treatment, or specific products should be used as after care after depending on which concentrate and booster is used? JM:Use the products that work best for you, to help you achieve your desired end result. The state of your hair is always changing which is why Kérastase has four concentrates and five boosters of pure active ingredients to instantly transform the hair. After receiving the treatment, your stylist can determine which is best for you by knowing each range’s results and benefits. The Fusio- Dose treatment is an in-salon treatment developed by professionals and is for professional use only. Click here to find your nearest Kérastase salon and get your own Angel hair.